Mutiny Hall, the newest creation from Seth Howard of Collins Pub, is set to open this Sunday at the corner of NE 65th St. and 12th Ave NE. Fans of Collins Pub will be right at home with the 20 taps of well-chosen beer and quality American pub fare. I was able to visit for their soft opening last night, and residents of the neighborhood are certainly in for a treat. Most importantly, there were plenty of great beers on tap, including two of my favorites: Chuckanut Pilsner and Boneyard RPM IPA. The layout is wide open and inviting, with quite a few tables and ample bar space. The highlight for the neighborhood might be their patio, which in its location is perfect for people watching while sipping on great beer. The food they brought out was similar to what you find at Collins Pub, with a great burger being a cornerstone of the menu. There are several TVs to feed your sports addiction, and the dining area is family-friendly. 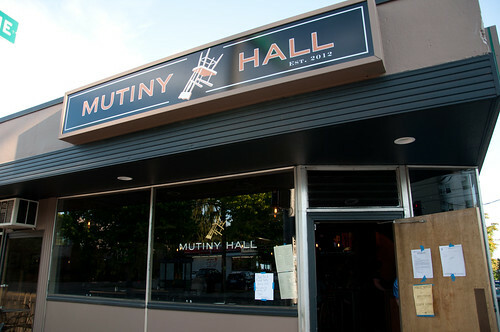 Mutiny Hall is another great addition to the Seattle beer scene and local residents are lucky to have it. This is Howard’s third establishment focused on great beer and food in Seattle (Hudson Public House being the other), and he’s definitly got the recipe for success down well. Can’t wait to stroll over to this place! Is this going in where Jalisco used to be?